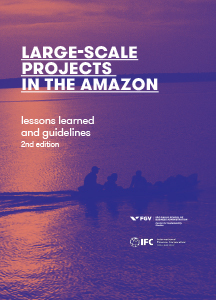 The initiative Large-Scale Projects in the Amazon – Lessons Learned and Guidelines organizes and sheds light on the lessons learned and recommendations for public policy and business practices so that a new relationship between large-scale projects and the territories they target in the Brazilian Amazon can be established. Led by the Center for Sustainability Studies at the Getulio Vargas Foundation (FGVces) and the World Bank Group’s International Finance Corporation (IFC), this initiative engaged over 470 people representing some 180 institutions. For almost three years diagnostic studies, practical tools and guidelines were put together in seven areas: Territorial and Land-use Planning; Financial Instruments; Institutional Capacities; Indigenous Peoples, Traditional Communities and Quilombolas; Children, Adolescents and Women; Legal Removal of Vegetation; and Development-Induced Displacements. The main novelty - and the focus of this update - is the inclusion of a set of guidelines resulting from a workgroup on development-induced displacements. A trigger of profound social transformation and a source of constant conflict and human rights violations, the issue is in a direct dialogue with the anxieties and concerns of the populations affected by large projects. Added to this are the lessons which underlie the Guidelines issued in 2017, derived from the almost always painful experiences of the installation and operation of large infrastructure, mining and logistics projects in Amazon territories.